Most oxygenated cleaners have surfactants that help boost the overall effectiveness of the detergent. These caustic detergents do a great job of loosening pollutants but in turn, they also raise the pH level of the wood. Why does this matter? The deck stain will penetrate better in acidic conditions and when the wood pores are opened up ready to receive a coat of new stain. A lower pH also darkens the wood not allowing the true beauty of the wood to show simple fix to this is to use a deck brightener. 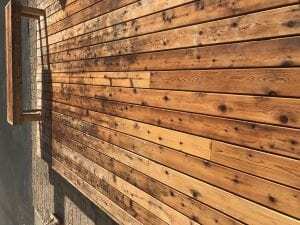 Wood deck brightener, also called deck neutralizer, is an acid based product that simply neutralizes the caustic cleaners and helps lower the pH level making the wood more acidic. This opens up the wood pores and brightens the wood bringing out the grain’s natural beauty. A simple application of deck brightener after cleaning is all that is needed to brighten and neutralize the cleaners and will complete the proper prep work needed for an outstanding stain finish that will last. I think it’s very important to address how these products might affect plants in and around the deck. Would they kill them, cause I have a ton of money invested in plants under my deck. That would vary by brand but in general, a wood brightener should not harm plants. 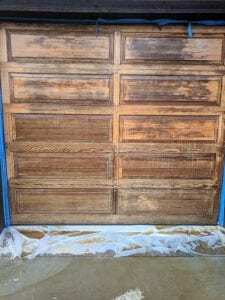 Hello, I’ve use a gallon of Behr Wood stripper and then applied Behr wood restorer and my solid cedar doors are still blotchy. I’ve also been sanding them to get them even. Any ideas? As for stain, I’m reading the reviews and would like any suggestions. Does not look like it stripped off very well. Try sanding all wood to remove the rest of the coating and then brightener after to even it all out. Try a penetrating stain when done. Easier to maintain. TWP or Restore A Deck. Should the deck be wet or dry prior to applying Restore-A-Deck brightener? I have cleaned and used brightner on my IPE wood furniture, 1. What happens if I miss some spots with brightner and 2. What if it’s a week due to rain before I can apply oil/stain? You can wait a week to stain but best not to miss any spots when brightening. it may show darker when stained in those areas. Our pressure treated pine wood deck is 9 months old. It looks very clean, however we plan on cleaning it with Defy Oxygenated Wood Cleaner. Is it really necessary to use a brightner after cleaning? Also if we do use a brightner, can we just hose brightner off? We are uneasy about using a pressure washer and do not own one. Third question is: If we miss a spot with brightner would it be obvious, before you stain? Yes, you need the brightener to naturalize the cleaner. Apply it and rinse off. Very easy to apply and rinse. My deck is now clean, stripped and/or sanded in some spots. The brightener can go on now, but I do not yet have the stain (I am still waiting for the samples). The temps in Spokane, Washington have begun to drop to 70 in the day, and high 40s to low 50s at night. 1. Is it too late this season (now mid-September) to apply the stain if the temps remain at these levels? Once I get the samples, I will have to wait for the stain to arrive here. 2. If I do stain, how long after the application should it NOT rain. I cannot control the rain, but how many days after application should I see clear skies in the forecast? 2. About 24 hours but it does depend on the stain brand and type. Question about restaining a deck. I have a pergola that I stained 2 years ago. I want to restain it with the same kind of stain (CABOT AUSTRALIAN TIMBER OIL). Do I need to use a cleaner and a brightener before I restain it. If not the brightener why not? Yes, you have to prep. Use a deck cleaner if using the same brand and color of the stain as last time. So no need to use a brightener to neutralize the cleaner? You can but you do not have to unless your prep removes the old ATO. Then you would brighten. How many days should the deck wood be totally dry before applying the stain as a rule of thumb. Do you have any recommendations on keeping the stain going on thin ie using brushes vrs rollers etc. 48 hours is normal. Use exterior deck staining pads for applying. I’ve stripped the deck of all the old stain over a number of weeks in April/May using Behr no 63. I’ve washed the deck often but now I realize I should have used a deck cleaner in April/May as opposed to now before I stain (in Sept). I plan to use the cleaner and then wait 3-5 days for drying before staining, Do you have any advice given that there were a number of months now where I didn’t neutralize the Base cleaner. I live in the Pacific where it rains constantly so the deck was often wet. Just use both a deck cleaner and a wood brightener and you should be okay. How does sodium percarbonate based oxygenated cleaner affect nearby shrubbery? What precautions must be taken when using it? We just prewet and rinse immediately any overspray and never have any issues. I am getting ready to stain a deck that was built last Sept. with pressurized wood and has never been stained or treated with anything. I understand that cleaning is important prior to staining. My HOA specifies a solid stain and I’m planning to use a Flood solid stain product in a chocolate color to match the HOA requirements. Is brightening still recommended even though the grain of the wood won’t show through the solid stain? One of the folks I consulted about doing the deck did not include it after I asked for it and said that it was unnecessary with a solid stain. Technically no it is not needed when using a solid stain. Is brightening generally just applying and a thorough rinsing? Or is a very light agitation of the wood with a scrub brush required and/or power washer? Thanks! Just apply and rinse after 15 minutes. I’m restaining a 2 story deck. The underside is stained and looks fine. The rails are still stained. The deck boards and rail cap are completely bare and weathered, but in great condition. I want to use TWP 100 series 102 redwood on the deck. If I strip and clean the floorboards, the stripper will run down onto the floor joists and partially strip the underside leaving a huge mess. Can I just use a deck brightener to prepare the floorboards for staining without affecting the deck underside? No. When you switch brands you have to remove the previous coatings on the railis. You would clean and brighten the floors if already bare. I’m looking to start making boat docks look more pleasing. Of course there on a lake with full sun and lake water. Is this product what I should use on these or do you have another one to try? Thanks in advance. For prep you need both a cleaner and a wood brighener. For the stain, try Restore A Deck wood stains. You say “A simply application of deck brightener after cleaning ” I think you mean “simple”. Good lookin out! I power washed my deck that was in bad condition. I’m not a pro at this and really gouged the wood with the power washer in areas. Despite that there’s still paint in some areas so now I’ve been sanding it off. This is very labor intensive. If I buy a stripper product how easily will the paint come off. Additionally, if I’ve sanded the wood is it really still necessary to put a cleaner on the deck. I don’t have tons of time to work on this deck. Thanks. Strippers do not remove paint. If you sand, yes you should finish with a deck cleaner. If it gets on the vertical wood, it will take it off. 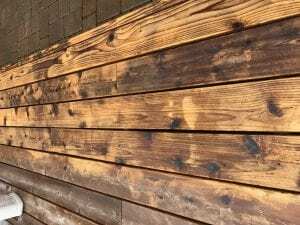 I do not want to darken my decking with a stain after oxybleaching is there a protective solution I can paint on that is colourless and do I need to use a wood brightener after bleaching? A clear sealer without any tint will not protect the deck from UV and will gray. If you want UV protection from graying, then you must use a stain and that will darken the color. Yes on the wood brightener. Just to add, I live in the northeast which is why I am running short on time! I have a 1 year old garage with pine siding. i was going to stain it this year with twp 1500 but am concerned that I do not have time to do it correctly using a brightener first. Am I ok to wait one more winter and apply stain in the spring? You need to use a cleaner first and then brightener. Brightener alone will not do the proper prep. You should be fine to prep and stain in the Spring. 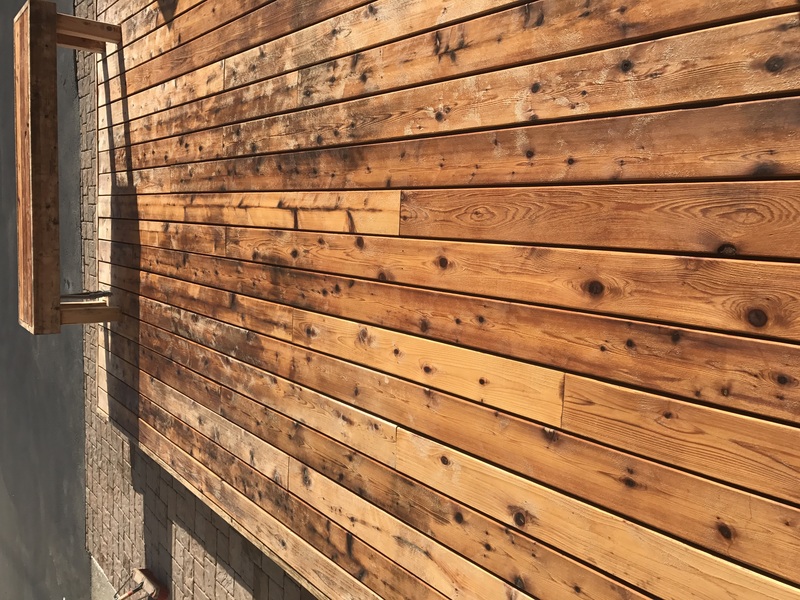 I’ve got a 13-year old cedar deck that I’ve sanded down to the wood and I’m about to stain with TWP 1500… how important is it that I use clean and brightener before I stain since it’s now raw sanded wood? I bought Olympic brand brightener & cleaner from the store because it was cheap, should I return it and buy the more expensive Restore a Deck ($60)? Many thanks! Best to prep after the sanding. It will help the stain to soak in. We are not fans of the Olympic since it contains bleach. The RAD product are not expensive considering they contain a cleaner and a wood brightener and make 5 gallons for each. Do not add a shiny or gloss coating to decking. It will peel and create a huge mess to fix. Best to use a fully penetrating stain. As for the brightener, any quality brand should work. If it rains after I brighten my deck, can I still stain (after 2 additional days of drying time) without reapplying the brightener? Yes. Rain does not harm the brightener. 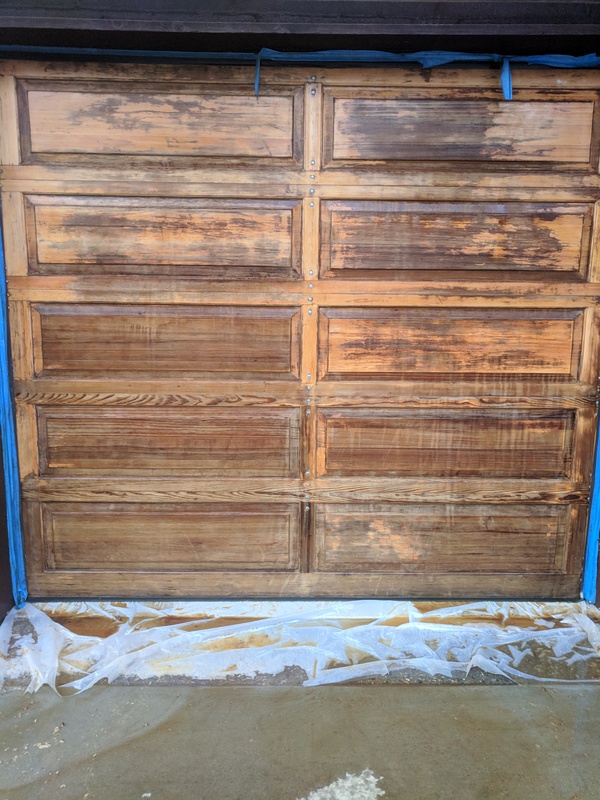 I stripped off our old stain and then put a brightner on it some of the boards look really nice but some have a black tent to them is it OK to use the brightner a couple times? The stain came off pretty good with the stripper. I did 10 foot sections and after I stripped it I put the brightber on it right away before I move to the next 10 foot section to strip. Can I stripped the rest of the deck and wait to put the brightener all at once on when I’m done? Confused on this. If you’re concerned about over-spray in tight places, can you brush the cleaner and brightener solutions? Thank you! That would not really help as you have to pressure rinse or pressure wash after you apply. I love the look of my sienna wood deck. After one year it now looks dull. What can I do to restore it to that lovely sienna wood colour? Clean and brighten the wood for the prep. Use a Restore A Deck Kit.